The plan had been to drive north on Ruta 5 until we saw the much used (on previous trips) turning to Totoral. Both Bart and I felt that we had been paying attention but we still missed the turning. 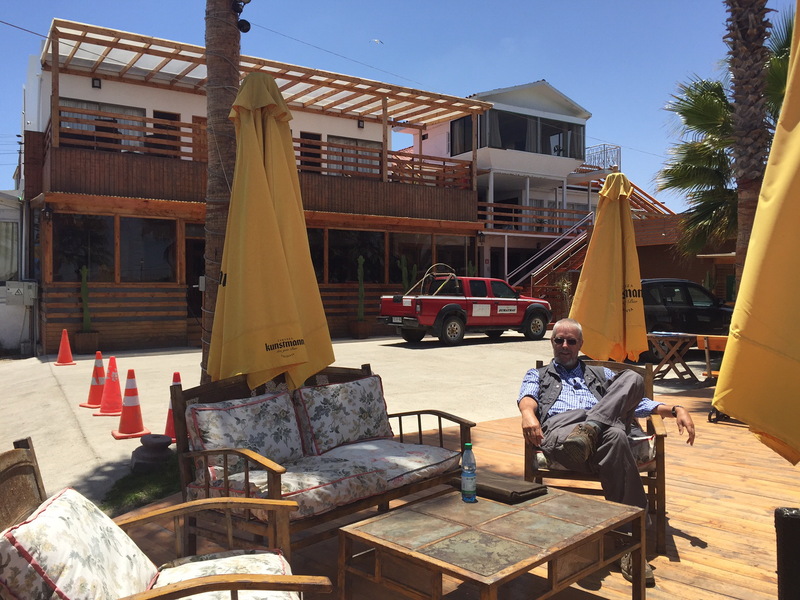 We ended up some 30 km south of Copiapo until we noticed. Bart suggested that we’d drive on to Bahia Inglesa, book into their favourite hotel, Coral de Bahia, so that Marijke could have a rest while the men went to Quebrada Leon to take a long overdue look for Copiapoa leonensis. I was driving, Bart navigating and Jonathan balancing our cameras around him as the track became more and more bouncy. Our memories told ud so expect a smooth drive in through several kilometers of sand, where in the past we had seen Thelocephala kraussii, but we seemed into the hilly area much earlier than anticipated. The main feature here seems to be extremely dry, close to death, Eulychnia, but they were in bud and even some in flower, suggesting E. breviflora. Eventually the track ran out and SatNav suggested that we might have wanted to be a few Quebradas farther south. Never mind, we were here now. As we climbed the hills, we found the plants: pumped up C. leonensis, that had recently flowered, and Copiapoa marginata. We climbed to the top where I photographed one of the largest lizards that I have seen in Chile, carrying a dead mouse in its mouth! Well done, big boy! From the top, we could clearly see the sandy area that we should have driven through, farther towards Caldera and decided to take a look there on our way out. The service road for electricity pylons provided excellent access and so we parked up. After half an hour or so it would appear that Thelocephala kraussii did not want to be found and we could hear the call of beers in Hotel Coral calling our names. As we prepared to turn around, Jonathan called us back – he had found some cacti out on the sand and wandered what they were. Copiapoa leonensis again, but I don’t recall them growing on this sandy flat. Had they been washed down by the 2015 rains? Or did they normally grow here, covered in sand, hidden from sight? But why could we not find the Thelocephala? Surely they would also have been covered by the fine sand. Sure enough, half way6 back to the car my eye was caught by two large wooly fruits standing upright above the sand. Bart volunteered to get a face full of sand while he blew away the dust to reveal a large group of Thelocephala. Pictures were taken before the fruit was harvested, but on closer inspection, the seed was not yet ripe. A week earlier we would have found flowers! The day was rounded off with the beers that we had heard call out for us earlier, used to wash down a big juicy steak in my case.